Just as we begin the season of Lent, which is a call to fast, give alms and pray … the Church presents us with the story of Jesus being tempted not to fast, not to give alms and not to pray. It all begins at his Baptism, when the Holy Spirit drives Jesus into the desert. 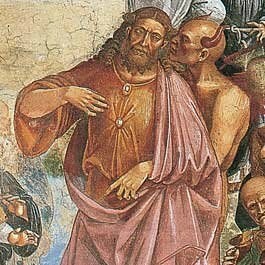 He fasts for 40 days and nights, and then the devil appears, to tempt Jesus in the same way — though at a far greater degree of intensity — as he does us. 1. The temptation not to fast. It didn’t make sense for Jesus and his disciples to fast. As Jesus told the John’s disciples, “Can the wedding guests mourn as long as the bridegroom is with them? The days will come when the bridegroom is taken away from them, and then they will fast.” Fasting was a discipline to mortify the body and demonstrate obedience to the law; Jesus was the Second Person of the Trinity fulfilling the law. Our Lenten fast is meant to help us strip away attachments to “treasures on earth where moth and rust decay and thieves break in and steal” and learn to store up riches in heaven, instead. We may want to make it easy on ourselves and skip the fasting. Lent reminds us that we “do not live on bread alone,” and forces us to grow our thirst for God by refusing to allow our lower appetites to control us. 2. The temptation not to give alms. The devil doesn’t have to go to such great lengths for us. We will worship at the altar of the world for a much cheaper price. You can tell what you really love by what you are willing to go into debt for. We are willing to go into debt for all kinds of things that are for sale in stores; but we would consider it the height of irresponsibility to go into debt giving money to the poor or to the Church. Lent is a time to redouble our efforts and learn the virtue of almsgiving — putting our money where our truest love is, in heaven. 3. The temptation not to pray. We are tempted in the same way. We know God wants to save us; do we figure he will no matter what? Do we spend our life in a kind of comfortable free-fall expecting God to keep us from dashing our feet against a rock in the end? Or do we pray to God, keep close to him, value our friendship, and so follow him the only way possible: Through the tough but joyful work of daily attention to our relationship with him. Jesus once said, “The gate is wide and the road broad that leads to destruction, and those who enter through it are many. How narrow the gate and constricted the road that leads to life. And those who find it are few” (Matthew 7:13-14). Lent exists to help us keep off the broad, easy road to destruction and follow Jesus on the harder, happier road to life.